Spray 4- to 4 1/2-quart slow cooker with cooking spray. In 10-inch skillet, cook sausage over medium-high heat until no longer pink; drain. Stir in leeks and thyme. 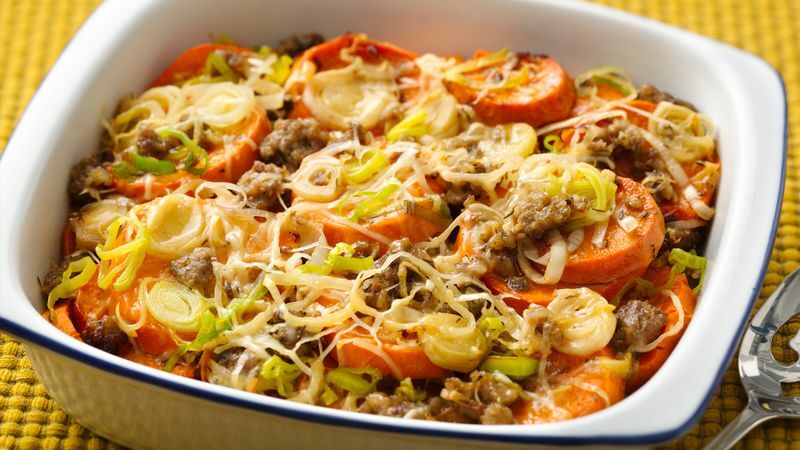 In slow cooker, layer half the sweet potatoes, sausage mixture and cheese. Repeat with remaining sweet potatoes and sausage mixture. Pour apple juice over top; sprinkle with remaining cheese. Cover; cook on High heat setting 2 1/2 to 3 hours or until sweet potatoes are tender. Clean leeks thoroughly before using them; they trap a lot of sand and dirt beneath their many layers. First, remove the green tops to within 2 inches of the white part. Peel the outside layer of the bulb, and wash several times in cold water. Many varieties of sweet potatoes are available. We like the dark orange-skinned sweet potatoes for this dish because they not only make a richer colored dish but also a tastier, sweeter one.